Near the start of Ramadan I was sitting in my friend’s house waiting for Iftar. Several members of his family were there along with some members of our inter-faith young leaders group which included myself (evangelical Christian – but not very young), a Catholic, a Hindu and a Sikh. There was a lot of laughter, conversation and good humoured banter throughout the evening. The homemade food was delicious and the evening ended with a real sense of gratitude for what we had eaten and the experience of sharing Iftar with such a diverse group of good friends. I’ve been involved in interfaith work for about 20 years and been to a few Iftars in that time, but this year it’s reached new heights. I’ve been invited to several and often more than one a day. I’ve also fasted on some of the days, although I usually start the fast with my regular breakfast at 8am but then refrain from food or drink until the fast is opened at 9:30pm. The experience of sharing the meals has given me pause for thought, when we think of fasting we tend to focus on the physical difficulty: clearly to train one’s body and mind to go without food is a challenge especially when it’s for such a long time as is the case with Ramadan in the UK this year. One of the things I’ve noticed when I’ve been fasting is how often I would usually eat a small snack, have a quick drink or taste food whilst cooking my boys’ meals. At each of these moments the physical act of the fasting becomes a mental act as we become conscious of reflex actions and applying self-discipline. Fasting, so easily perceived as physical, is a significant mental exercise. Of course it also encourages us to focus outward using the hunger pangs to remember the many millions starving and to have a small glimpse into their experience. For me as a Christian, as for many other Christians and Muslims, fasting is not just a physical or mental but a spiritual one. When I was speaking to young Christians about fasting, I had to remind them that Jesus expected his disciples to fast but that it should not be seen as a chore. It’s not the same as being told you can’t watch TV for a week as a punishment for bad behaviour. Fasting is about making space for prayer, for denying ourselves food and drink in order to rely on God to sustain us. The moments of thought when we are about to eat, or the pangs of hunger can be used to point or thoughts and prayers towards God. Time usually spent cooking and eating can be used for prayer or reading the scriptures. The significance of fasting is that the physical, mental and spiritual all combine and build on each other. The spiritual life encourages fasting, hunger pangs remind us of God’s provision the stopping and thinking creates space for prayer which inspires the fast and so the circle continues. However, the experience of Iftar has taught me two things for further reflection. 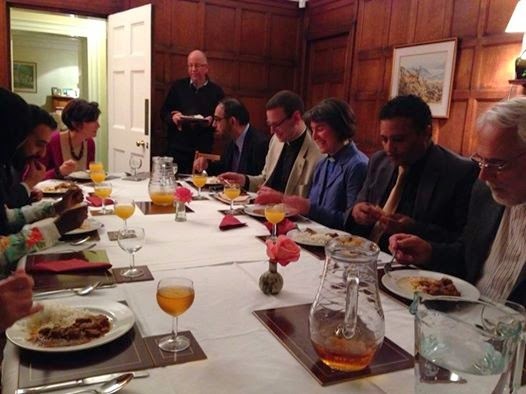 Firstly the communal nature of Iftar is a really significant part of fasting. As Christians we, like Muslims, affirm the communal nature of our faith, but the act of sharing Iftar reinforces this community even if during the day we are fasting alone at work or at school. By knowing that you’ll come together at the end of the day is a great encouragement to keep on going. The Bible speaks of us spurring one another on in good work and that we should encourage one another and build each other up. A Muslim friend once said to me that we should try to outdo one another with acts of righteousness. Waiting to eat with friends at the end of the day certainly encouraged me to keep going, the spiritual exercise of fasting was made easier by the encouragement of knowing that friends were doing it and that we would end it together. This leads me to my final reflection; that how we end a fast can be as important and meaningful as the actual fast. In the past when I’ve fasted, I’ve just ended it with a quiet meal by myself or with my immediate family (there’s only four of us). But to meet with friends and to have the ritual of eating dates and prayer before the meal gave a highlight and focus for the end of the day. It reminded me that faith is not an isolated task but that, counter to the individualism of wider society; faith inspires and is inspired by community. 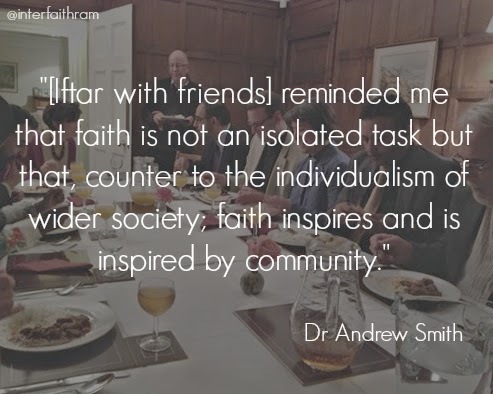 So thanks to all the friends who have invited me to Iftar, it’s been a very special Ramadan for me so far and one that has encouraged me to revisit and deepen the disciplines of my own Christian faith. 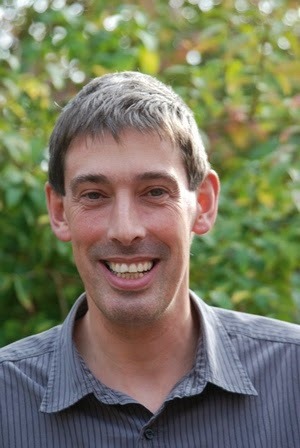 Dr Andrew Smith is the Director of Interfaith Relations for the Bishop of Birmingham as well as being founder and chair of trustees for The Feast a charity bringing together Christian and Muslim teenagers. He has been involved in interfaith work for the last 20 years and has written a number of articles on the issue and is a regular speaker on interfaith matters. He also works in association with Near Neighbours.